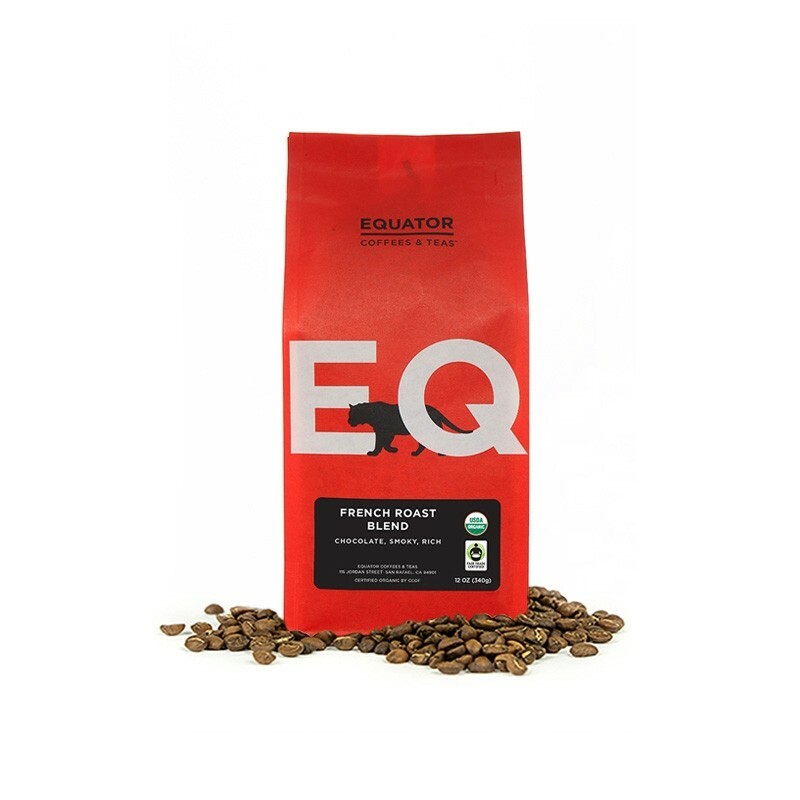 This is the French Roast Fair Trade Organic brought to you by Equator Coffees & Teas. The goal with this certified Organic and Fair Trade blend is to develop delicate smoky nuances while retaining sweetness, richness and fruit-toned dark chocolate flavors. The blend combines coffees from Latin America for chocolaty and spicy flavors, Sumatra to provide balance and richness to the blend, and Ethiopia to contribute aromatic nuance. Even though this coffee was smooth and not harsh or bitter, it wasn't very flavorful. The smoky and chocolate notes were hard to recognize. This has been my favorite so far. This coffee may be best I have received yet. I really enjoy Sumatra coffee. Love this coffee. I’m a rookie at tasting notes so forgive me for stealing from package label, but would agree in its description as bold, smoky, and chocolatey. That last two together give it a very balanced flavor and feel. Like the level of roast. Very full, rich cup of coffee. Good medium dark roast coffee with strong chocolate tones. Smooth finish with no bitter aftertaste. Roasted fresh prior to delivery with great aroma. The only reason I didn't give it 5 stars was more of personal preference for a little darker roast. bold, a bit bitter, not very smooth. So smooth and lovely. I'm so used to burnt and bitter it took me til my second cup to realize I was in love. No more Starbucks garbage coffee for me thanks! It was a bit too dark. Just a bit. I enjoyed this one but want to explore other coffees for a while. Second try was as good as the first. Highly recommended! Little on the bland side, not as robust as some others have been. Love the rich creamy flavor, very comforting. This is a coffee I would normally go for because love the chocolate coffee flavors. Looking to try something with more complexity. Intro: I am not a big box store coffee drinker. Even the thought of a major coffee chain could send me into heartburn convulsions. It kills me to know how many precious little bags have been burned into bitter beans. A moment of silence please for the fruits that have lost their lives in vein. I like my coffee to mirror my personality. Dark and abrasive with a mysterious side. Brewed in a regular coffee pot, that is exactly what you will get. But, let these magical little beans simmer in a French press for 8-10 minutes, and you will unlock an amazing and equally intriguing coffee experience. I presume the oils not being stripped away by a paper filter allows the full rich flavors to touch the deepest part of your soul without the slightest bitter note. I experienced much of the same inner-coffee-zen utilizing the pour-over method. Again, the lack of a paper filter unlocked the magical stairway to coffee heaven. Unfortunately, this was not a great candidate for a cold brew, but that is not a deal breaker in my book. So in closing, thank you! I like the smoky, deep flavour. Good not great. It didn't blow me away, and I'm not sure what it was. I thought it was fine. I would buy this from the supermarket and brew it in my coffee pot when we have company. I didn't hate it. I hate to give anything low stars because I know a ton of work goes into this stuff, but all in all it just wasnt for me. I don't really know much about coffee, but I really like that 'coffee' flavor. I would say in general I don't like smokey flovors, or at least that schotch smokiness - not that this had that, but it said smokey on the label so I wanted to make a note about it. Thanks for your time. I really enjoyed how this coffee didn't coat your mouth like a lot of heavy coffees do. It also tasted very fresh, and didn't have that overpowering coffee flavor that smells great but when you actually taste it, it can be a little off putting. I also like how I have found when you get coffee's this dark i find many can get acidic and this one has found a nice balance. Good, solid coffee. Nothing especially stood out about it. Great coffee. Did not taste any chocolate notes. But it was very nutty in taste. Strong aroma, which I liked. For some reason I taste pine as well. Looking forward to trying something new next month. Maybe a medium roast or something fruity. I don’t care for it. The strength, roast, and color were fine, but there was an overwhelming taste that dominated. Maybe earthy? Anyway, it seemed to lack balance as a result. Coffee was sour. Tried multiple times to drink it, but couldn't stomach it w/o milk and sugar. I did not like this coffee at all. I confused this with the last we haven't received this one yet. A great coffee however to me there was a hint of bitterness. Maybe that was the smoky nuance or spicy flavors. Delicious - very smooth! Great cup of coffee! Wow!!! This coffee is amazing!!!!!! I can taste the chocolate, it’s perfectly roasted, and it’s dark! Thank you!!!! Good coffee- we could use a little more of that STRONG coffee taste, but almost there! Thanks. Kind of earthy and stale-tasting. Too much imputed flavor. Way to dark for my liking. Tasted like burnt coffee. Couldn't taste any spice and barely any chocolate. Wow, it's been a while since one really struck a chord for me, but this is like my perfect coffee. I've been using the aeropress for this one for an afternoon lift... Absolute perfection! Really liked this, didn’t think “smoky” and “chocolate” were going to be flavors we liked but it was fantastic. just personal taste- I normally don't like coffee with strong chocolate note. Nothing really unique or exciting about the flavor. I wouldn't consider it an outstanding blend. Certainly smooth and drinkable, but nothing more. Thought it was very good. I don’t think I probably made it correctly with coffee v water ratio if I had I think it would have been even better! I’m inexperienced, so not sure what I’m talking about. But I think I prefer a slightly darker roast. For some reason I was expecting some flavor at the finish I didn’t find? Rich and incredibly flavorful. We loved it! Great coffee, both hot and iced. Aroma is better than taste, but I happily drink it every day! I found the coffee to be to light and not at all bold. 7.5/10 I drink my coffee black, made with a French press. The coffee has lots of character with strong notes of unsweetened cocoa powder and charred oak. I think I would like it a lot better as a half-city roast with more of a smoky flavor than the full-city roast and the charred flavor. My girlfriend drinks hers with heavy cream and a teaspoon of sugar. The cream and sugar really brought out the chocolate flavors of the coffee well and diluted the charred taste to an appropriate amount. After a few batches I got the flavors to balance out nicely, less smokey and more sweet. Turned out quite good. This one is my favorite so far. It brews well in both the french press and our dripper. I love how rich and bold it is. I could drink it every day. Not as flavorful as expected, or as bold. Just OK all around. It was a refreshing, smoky, bold blend. I liked the very subtle sweet undertones. It was good though I wasn't blown away. Very good coffee though. I didnt like this coffee very much. The initial taste was good but there was a very strong aftertaste that reminded me of black licorice, which im not a fan of. I tried to brew it a few different ways, less beans, more beans, longer steep time, shorter steep time, nothing got rid of the aftertaste. The coffee was good. It had a nice flavor overall. It seemed really chocolate forward to me. It was a little smokier than I would have liked because I felt like it masked some of the nuanced flavor that I like to enjoy with my coffee. We usually don't like French roast because they are a little too acidic and that was the case for this one. but we did like the chocolate and dark roast of this blend. Liked this one, good aroma but no bitter bite in aftertaste. Really like the bold flavor. The smell is fantastic. Great pick. I thought this was well-rounded, with a great balance of smoky to chocolatey. I could sip multiple cups of this on a rainy weekend. However, I thought it was slightly lacking in caffeine, so I would not drink on a weekday. Meh, a little too smokey. Drinkable but not great. This is my jam! I really like this one. Maybe a little one note-ish but I need to finish off the beans to let it all sink in. I very much enjoyed this french roast. I was pleased it wasn't as overly roasted as most french roast coffees. This is especially good for adding cream. As a standalone coffee it is very good everyday cup without being very exiting. Good as American press and pour over. Exactly what I want when I want a dark roast. And by far my favorite dark roast out there. 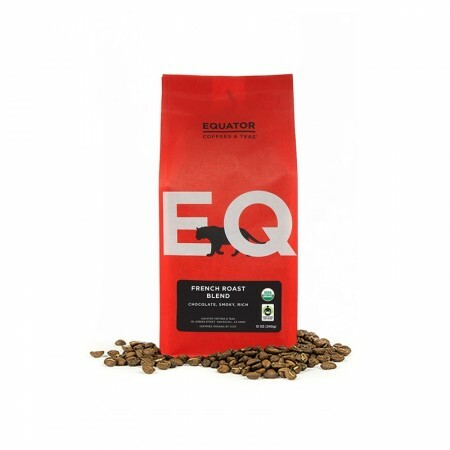 I’m not a fan of French Roasts, but I am a fan of Equator coffee. Nice, but missing a certain middle note. Like my speakers. Flat on the mid-range. Hollow. Is this the same as the EQ french roast BLEND- (which we do not like that well)? My favorite coffee so far. Smooth enough for me to drink black and sturdy enough to hold up to a little sugar and milk for my wife. This is a great coffee. The Smoky, Chocolate, and Bold tags are spot on. Bold coffee flavor hits the taste buds right away and then a smooth decadent chocolate flavors lingers after swallowing. Great French Roast! Very nice overtones but lacking in diversity. A little too smoky. We always seem to like french roast for our cappuccinos. This was no exception. Another great coffee from Equator! I am picking up on a medium bitterness and good body with mouthfeel. The smokiness is about a medium level and the chocolate similar to dark baking chocolate very pronounced. Im not really tasting the dried plumb or walnut taste. I've used both the Clever and DELonghai espresso machine to produce americana's. Great results with this coffee using both methods. I would not hesitate to order this one again, great coffee. It was fine, and I'd be happy to have it as a normal coffee, but I did a side by side taste test with this and the week I received previously, and this one paled in comparison. It has that more acidic flavour that I don't care for as much. A rich, smooth cup of dark roast coffee. Very nice coffee. Positive that it's organic, but a little less into the french roast taste and the beans are a touch too oily. Overall a good tasting, smooth coffee with a hint of bitterness (but more like fruitiness). This is the best one so far. Bold and smooth tasting. Please keep them coming. Finally a coffee I can assign four stars to. Very good!! Good stuff. Bold but smooth, you don't have to make it strong for it to taste strong and rich. Best so far! Not acidic or sour. Really enjoyed this one. Overall #1 and #3 were wonderful. This coffee did have good body and a decent boldness to it. Unfortunately, I was unable to detect any of the nuances touted in the review. I did find it to have a sweetness, but it wasn't a traditional sugar-in-your-coffee sweetness, more of an aftertaste rather than a presence while sipping. The coffee was smooth, but did not lend itself to a roasty nutty punch you in the face coffee as I prefer. Enjoyed this one. The intensity was good and balanced from start to finish. The flavor profile was too my liking. I didnt find the flavors spicy like in the description but rather earthy, smoky, with hints of dark chocolate. It didnt taper as much at the end as I like just a touch of mellowing but overall a very good coffee. I used this coffee for cold brew, which is what I make for most of the summer months. It was indeed, very smooth, and the sweet, fruity flavors made it a good cold brew bean, while still having the dark notes I enjoy so much. Much more bitter than what I preferred without much flavor payoff. For me this is a basically good coffee, with enough body and solid roasted coffee flavor that I enjoy it. The nuances of its flavor profile, as described, are a bit too nuanced for my tastes--in other words, while I suppose I can taste the chocolate a bit, the spicy flavors described or the fruit tones are lost on me. I can enjoy this coffee, and will, but it's not anything that leaves me feeling like I'd go out of my way to purchase it again. Solid, but not much personality to me. A fine coffee but nothing special. Was a little disappointing after the last one from Equator–their Panther Blend was amazing. For some reason it brewed a little muddy for us, even though we brewed it the same way we always do. I tried brewing this roast in a number of different ways and really e joyed the flavor. Ok - fairly acidic which I did not care for. Full flavor without being bitter. Loved it. I dont know enough about coffee to comment on it in detail but everything bout was right on. Neither my husband or I have ever liked French roast in the past, but we were pleasantly surprised by this blend. A good rich, bold flavor. Not too overpowering. Not too weak. Very smooth. Wonderful aroma. Good body. Smoothe. This is pretty good - I did taste some acidity in this coffee, which I don't particularly care for. Still much better than your average cup but don't think I would buy it again. It was ok but didn't excite us. The flavor was ok, but it seemed a bit one dimensional. The flavor profile is excellent. This is much closer to our liking than the first two coffees we received in January. This is a slightly darker roast than we prefer, which is why I have given it a 4 star rather than a 5 star rating. The flavor took awhile to grow on me. Not as smooth as last months pick, but now I love the rich smoky flavor. Like it very much. Good & accurate description of the taste / flavors involved here! I like the dark roast in this one, smooth and strong. Smells great in the bag, too! It's smooth and non-offensive, but it lacks in "personality". I usually drink my coffee with a little milk or half and half, and it makes this coffee even more blend. I think it's okay, but not anything to write home about. This was a very good blend for us. We would like a similar blend next time. We drink coffee with milk or half & half. Did not taste bitterness that we have experienced in darker blends. Probably more like 3.5 stars. The flavor on this one was good, but it didn't quite have the bitterness or deep flavors I normally go for. But it was super smooth and soft. If this were a chocolate, I would ask for more cacao and less milk :-). Very smooth. Chocolate notes are not too pronounced; great balance. Coffee is weak. I prefer a darker and bolder bean. The taste was good, not acidic. It was smooth, just not strong enough. This is one of our favorites of the ones sent in our first batch of five. I am in no way a coffee expert but I do love coffee. I can tell attributes of nose and taste with wine but I don't seem to have the same skills with coffee. I would like to learn. I was able to distinguish the "spicy" flavors mentioned in the note and it did notice a pleasant bitterness (for lack of a proper coffee descriptor) at the finish. I would love to see some specific brewing instructions with the coffee to make sure I am using the lovely beans to the best of their goodness. Very good. For my palate, I tasted dried apricot along with a nuttiness. This is probably one of the best ones I've received so far. Thanks! Smelled great. Just made first cup. Nice strong but not knock your socks off strong. Frothed up some milk to drop on top. Can't wait for second cup. delicious. Smooth. Enjoyable. Incredibly fresh beans, wonderful aroma and some enjoyable flavor notes were all ultimately ruined by a truly unpleasant burnt finish. Well balanced, medium brew. Best coffee I received from Misto to date. I really like this roaster. The big brother to this Sumatra is the Panther - which is my all time favorite. For those who want a rock solid best of class this is a brew for you. It was good but not our favorite. Needed more umph in the flavor department. It was nice for those days you wanted a lighter cup but we don't typically veer in that direction. This has been by far one of our favorite coffees! This coffee has such a rich flavor to it that you simply drink it black! So good! This was a good, solid coffee. It had some great flavor and body. I'd consider this one again. Great hot morning coffee... think this will rise in star power over the winter because it has a very hearty taste. It was alright, not the greatest cup I've had, but not the worst either. Fantastic chocolate/cinnamon/cacao aroma when ground - one of the best ever. Under-delivers on the palate, though - muted, with little complexity. Cold extract, maybe? One of the best French roast coffees I have tasted. True to the notes of the curator. I liked this one because it was bold and perfect for making espresso in my new Moka pot. Had a small bitter after taste, but the more I drank it on a daily basis, the more I looked forward to drinking it, so I say, great coffee. great cup. nice smokey flavor. I'm not sure how you guys do it, but you do it well. After asking for a smokier, bold flavored coffee that still has some floral and fruit notes, I thought I was asking for the moon. Somehow, you guys delivered! I really like the balance of this coffee between the bold, smoky flavor and the lighter notes. It's a truly versatile coffee that has all the flavors you can imagine. I actually liked this coffee better in my Chemex than my french press. It seems to strip away a little of the robust body and let the fruit and floral notes shine. In the Chemex, this was very nearly a perfect cup of coffee. If I could somehow blend this and the Division blend from last time, I think it'd be the perfect cup of coffee. More like the last two please! A well-rounded, smooth blend, that's easy to drink. The smoky nuances on the back end were the first things I noticed, along with a little sweetness. I prefer this over some coffees that leave me feeling like I just smoked a cigarette haha. I didn't pick up any chocolate or spice but I don't have a strong palate, so that's probably why. Again, a well-rounded cup but nothing that jumps out and surprises me. Tastes fine, just wasn't able to find anything interesting in the coffee. Our favorite coffee you sent so far. This is dark, smokey, rich, but somewhat floral. Absolutely fantastic. Nice cocoa flavor but does have a bit too much bitterness for a lighter-roasted French Roast. Love it. Fresh and strong and rich. Thanks. Great coffee! It has a deep flavor that I really enjoy. I don't typically drink coffee black, but I liked this one so much that I don't cut it at all with cream. My favorite blend so far. This one has that depth of flavor along with a smooth, earthy but bold profile that makes me glad I found Mistobox! I liked this one, very much. It lives up to its description and I wouldn't mind more in this category. A bit mild but good flavor. It worked perfect when I increased from 1.5 scoops to 2 scoops per 16 oz cup. A little too sweet for my tastes, but my wife loves it! It took me a few pots to get it to the darkness that I like, but it was a good coffee. No bitterness and good flavor. Since this was my first coffee, it will be interesting to compare it as we go along. the French Roast Fair Trade Organic from Equator Coffees was a big hit. I rated it a 4 & my wife rated it a 5. Keep up the good work. This is absolutely rad! My favorite beans ever.You usually get more crema and smooth acidity from less darker and oily beans, but the downside is that they usually tend to be sour and not smoky and rich in taste. This is not a very dark and oily roasted bean but it surprisingly has a mouthful and complex smoky taste; not sour, with a perfect acidity to just provoke your taste buds and the crema is smooth and thick. Absolutely love it! By far the best coffee we have experienced from MistoBox. A great flavor profile, brews terrifically in a French Press. Five stars. Very nice coffee. Fresh oily beans, deep flavors without being too acidic or bitter. Great cup of coffee, nice rich aroma and flavor. It's a bit too grassy tasting for my liking. The acidity is a bit high as well. I really enjoyed the fruity chocolate coffee. It was smooth and balanced and not too smoky! Amazing complex coffee. Bold with hints of nuts,chocolate,smokey, spicy, and sweetness rolled into one. Very robust with a pleasant finish. This coffee will please both light and dark roast lovers. We have tasted 100's of coffee and this is only the 2nd one we have every rated a 5 star. Personal rating of 4.75 the highest we have ever rated a coffee. Very aromatic and strong flavor. Our favorite so far but still lacked some complexity. Great coffee! I'm not used to fruit tones in French roasts, and that is probably the one thing standing in the way of a five-star rating. I like my coffee smoky and dark. That being said, this coffee is very smooth and rich, and the aroma is amazing. Just grinding the beans put me in a good mood. Love it. Favorite coffee thus far. Tastes like toasted goodness, just a touch sweet. Perfect. A solid French Roast. Really enjoyed this one. Full bodied roast with smokiness. Very well-balanced - A perfect start to the day. This blend highlights the best of both beans while keeping any one flavor from becoming too overpowering, and, although it's a French roast, it is still fairly light. Smooth and very well balanced, and I would happily drink something like this again. I would like to try something nuttier, however. Although I found this roast superior than any Supermarket whole bean dark roast. I still found that it was inferior to a Starbucks French Roast. I like the taste but I'm not one for decaf coffee. I am still playing with it a bit, and the flavor is opening up somewhat. But I'm not terribly impressed with the depth of flavor. It tastes mostly like a solid cup of coffee, but not particularly elevated above the mainstream coffee blends. Solid, but doesn't justify the high cost in my view. Really good French Roast. So much flavor! Love it! Very flavorful and smooth! Has been my go-to for the late afternoon if I'm seeking another cup. Smooth all the way through. I don't get the spice or fruit but there's a richness and soft chocolate, sea salt taste to it. Actually, we give this a 4 1/2 stars. It was .smooth with sweet overtones yet had a deeply roasted taste. It was to us the coffee bean version of how the flavor of nuts are enhanced when you toast them. Nice but a bit generic. Would probably just pick up the cheaper version in a supermarket. great blend. will reorder this one. I think I'm into anything french roast.